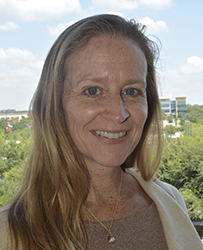 Kathleen Murphy, Ph.D., is a Senior Researcher at the American Institutes for Research (AIR). Dr. Murphy is the Principal Investigator for two of AIR's knowledge translation centers funded by the National Institute on Disability, Independent Living and Rehabilitation Research (NIDILRR): the Center on Knowledge Translation for Employment Research (KTER) and the Center on Knowledge Translation for Disability and Rehabilitation Research (KTDRR). KTDRR carries out training, dissemination, utilization, and technical assistance activities to increase use of relevant evidence-based research findings that inform decision-making and increase NIDILRR grantees' and others' understanding and application of knowledge translation principles. Through her work with these centers and other NIDILRR-funded work, Dr. Murphy has a decade of experience leading research on knowledge translation activities among NIDILRR grantees and the KTER Center’s primary audiences: vocational rehabilitation professionals, people with disabilities, the business community, and policymakers. Current and recent areas of focus include adults with autism, transition-aged youth with disabilities, outreach to the business community, and support for employees with cancer.